here are six professional Lay Clerks in the back row of the Choir: two altos, two tenors and two basses. 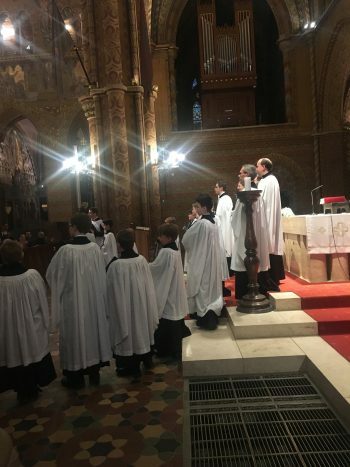 They sing Mass every Sunday with the choristers, as well as other special services. Some services during the school holidays are sung by the men alone. There is a list of approved deputies. If you are a professional singer with experience of singing choral music email the director of music for details on how to apply for an audition to join the list.